The Triple Crown… Many Congratulations to fellow Sherpa Adventure Gear Athlete, Kenton Cool! Just heard the news and am SO hugely psyched for my dear friend and fellow Sherpa Adventure Gear athlete Kenton Cool..! 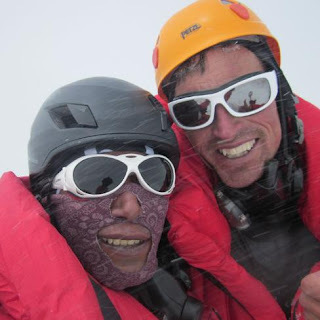 A tremendous achievement successfully scaling the three mountains of the Everest horseshoe – Everest (8,848m), Nuptse (7,861m) & Lhotse (8,516m) in one climb. A massive, massive well done to Kenton…! Kenton Cool, Britain’s most successful Everest mountaineer, the second-most successful Western Mountaineer of all-time on Everest, has summited the three mountains of the Everest horseshoe – Everest (8,848m), Nuptse (7,861m) & Lhotse (8,516m) in one climb – completing the ultimate ‘Three Peaks’ challenge. The first Everest Three Peaks comes nine days before the 60th anniversary of Tenzing Norgay and Edmund Hillary’s first successful ascent of Everest in May 1953.